Advertise, and market the property for rent. Using local print advertising, Internet sites, and relocation networks, etc. No charge for any of our weekly/monthly inspections, photographs, reports, etc. Schedule yearly inspections and routine maintenance. This includes gutter cleaning, air conditioning service, pressure washing, etc. The Full Service management program is a very complete service with an attention to detail and professional commitment. 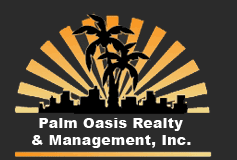 PalmOasis Management Inc. strives to provide the highest level of service to our owners and tenants. Because of this, our tenant’s work with us to ensure your rent is paid, and you’re home is properly maintained. Prices vary according to service levels requested.